Why a Latino / Hispanic Trucking Coalition is Necessary? Who Should be a Part of a Coalition? Reform of the California Highway Patrol’s BASIC Inspection of Terminal (BIT) will also change how brokers, shippers, motor carriers, and others validate participation in BIT (while the acronym is unchanged, it is no longer called the Biennial Inspection of Terminal program). Many brokers and motor carriers as part of their carrier selection process (sub-hauler checklist) ask for proof of enrollment in BIT, it’s important to note there is no longer an enrollment application (or even fees to be paid to CHP). Proof of enrollment in BIT is having an active Motor Carrier Permit (MCP) since DMV collects those fees now when renewing or applying for an MCP. BIT fees are actually now called a Carrier Inspection Fee (CIF). You will still want to check DMV’s active list of MCP’s to make sure the permit is valid; we have seen phony photo-shopped MCP’s. 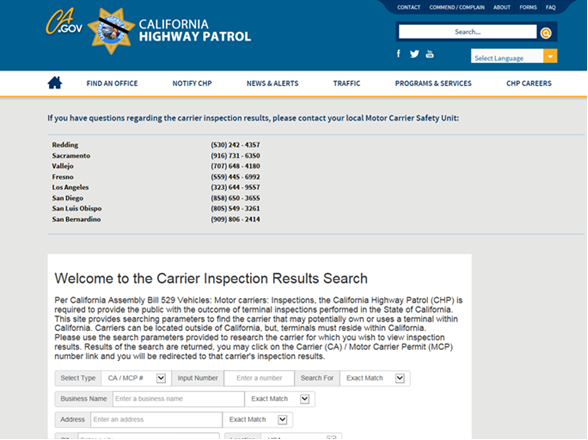 At the end of last year California Highway Patrol (CHP) quietly rolled-out a new Carrier Inspection Results search feature for motor carriers (and the general public). As part of the BIT reform, the CHP was required to provide the public with the outcome of terminal inspections performed in the State of California. Finding our results is now at your fingertips.